Well it's finally here! The KAPCITY Show premiered its pilot episode, with an interesting twist. We are introduced to DJ Keezy (played by KapCity, in case you were wondering), a DJ (who does the most) who is also a Kap City fan. 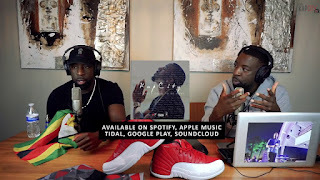 KapCity (previously known as Kapital K) discusses his bold and decisive transition from Africa to the United States of America in pursue of his music career. He also talks about the name change. Currently based in Miami, Florida, Kap explains why he feels he's where he needed to be and how he needed to get off his "Komfortable Sofa" to achieve the goals he wants to attain. KapCity ends the interview with a freestyle to Meek Mill's Litty. It is certainly an interesting flip on talk shows. I will definitely be waiting for future episodes.